Mozilla sent Firefox Version 22.0 to the release channel. The current update includes fourteen security updates of which four are critical, six high, three moderate and one low. Social Services: New to version 22.0 is the ability to disable social media services that may be included with installed add-ons. To disable social services, open the add-ons manager and select Services to disable or remove any service that you have installed in the browser. Plain text files: Word-wrap is a welcome change to viewing plain text files in this version of Firefox. NEW -- WebRTC is now enabled by default! Oracle released the scheduled critical security updates for its Java SE Runtime Environment software. This is a Critical Patch Update that contains 40 new security fixes for Oracle Java SE. Oracle indicated that thirty-seven (37) of the vulnerabilities may be remotely exploitable without authentication. This was described as the possibility of being exploited over a network without the need for a username and password. Additional details about the update are available in the Oracle Quality Assurance Blog post, June 2013 Critical Patch Update for Java SE Released. If Java is still installed on your computer, it is recommended that this update be applied as soon as possible due to the threat posed by a successful attack. For those people who have desktop applications that require Java and cannot uninstall it, Java can now be disabled in Internet Explorer. See Microsoft Fix it to Disable Java in Internet Explorer. 3) If you use Firefox, install NoScript and only allow Java on those sites where it is required. UNcheck any pre-checked toolbar and/or software options presented with the update. They are not part of the software update and are completely optional. Starting in late July, Microsoft will be eliminating the "linked accounts" feature from Outlook.com. While this feature has been used for many reasons, particularly where you don't want to provide your primary email address, security is the primary reason Microsoft is giving for this change. According to the announcement by Eric Doerr in the Outlook Blog, it has been increasingly found that linked accounts are less secure than using aliases, particularly because it is possible to sign in to Outlook.com on the web and then switch to any other linked account without entering a password. With the elimination of linked accounts, the remaining options currently available are to use mail forwarding from the previously linked account or create an alias. Microsoft is reportedly working on setting up the ability to move an email address and the accompanying email from one account to another. Mail Forwarding: You must sign in to your forwarded account at least once every 365 days. If you don't, the system will close the account. Reply to Forwarded Mail: In order to reply directly to email forwarded to your primary account, it is necessary to configure Outlook.com to send email on behalf of a secondary email account. Information on how to create an Outlook.com alias and set up mail forwarding is available from Microsoft in the help documents linked below. I am an Outlook.com Insider. 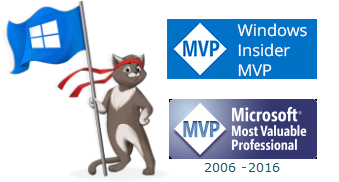 If you have a question about this post or Outlook.com, please leave a comment and I'll do my best to assist. Learn more about the Outlook.com Insiders program here. Java, how we love to hate you! Many people have uninstalled Java and do not miss it. That is most likely because they do not have desktop applications that require Java. Unfortunately, that is not the situation for those people who use Java-dependent software programs. Until recently, Internet Explorer was the only major browser that did not provide a way to disable Java. 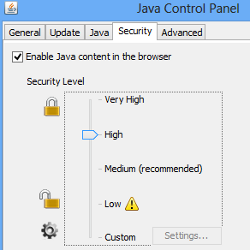 The only way to completely disable Java in IE was to disable Java through the Java Control Panel, which meant re-enabling Java when using Java-dependent programs. That is no longer true! Microsoft released a Microsoft Fix it solution designed to block all Java web-attack vectors through Internet Explorer. As explained by Cristian Craioveanu in the below-linked Security Research & Defense Blog article, the Fix it solution is made up of two parts. The Fix It uses the Windows Application Compatibility Toolkit to change the behavior of Internet Explorer at runtime to prevent Oracle’s Java Web plugins from loading. As a result, the Java ActiveX dlls are not loaded. The second part of the Fix it clears the access control list (ACL) in the registry for the Java Network Loading Protocol (JNLP) handler which prevents Internet Explorer from automatically opening files. For the changes to take effect, restart IE. To undo the changes, run Microsoft Fix it 50995 and restart IE. The Fix it solution has been tested by Microsoft and will work for all versions of Java from versions 5 and above. It also works on all supported versions of Internet Explorer, whether 32- or 64-bit. Adobe has released security updates for Adobe Flash Player and Adobe AIR for Windows, Macintosh, Linux and Android. These updates address critical vulnerabilities. Microsoft released five (5) bulletins. One bulletin is identified as Critical with the remaining four bulletins rated Important. The bulletins address 23 vulnerabilities in Internet Explorer, Microsoft Windows and Microsoft Office. The updates to IE and Windows require a restart. Having used Hotmail for a very long-time, when Outlook.com was first introduced, I wasn't all that certain that I liked the changes. However, it did not take long to appreciate the different features and I have put behind me any skepticism I had about the change. Even though the migration of your Hotmail account to Outlook.com was completed a number of weeks ago, you may still be struggling to discover how to complete tasks that were second nature before the migration. First a few quick tips and then a closer look at attachments and the Actions link. To see the Menu bar, click any e-mail. Click "New" to start a new e-mail. To add additional recipient(s) to an e-mail, click To or the box below To. 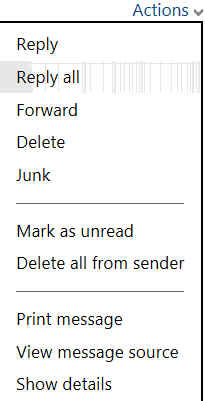 To reply all or forward an e-mail, click the down arrow next to Reply or click Actions, shown below. Sending and replying to e-mail is, of course, the primary function of your account. Often times that includes an attachment to accompany the message. The familiar paperclip icon has been relocated from the e-mail creation area to a more logical location, the Menu bar. This change makes complete sense due to the ability to not only attach a file but also embed a picture inline or share a file or picture from SkyDrive. 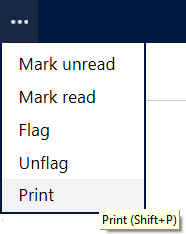 The change to Outlook.com still includes the familiar paperclip icon. It is the wording and location that have changed. Insert is a better description because the option to insert pictures inline or share a link to a file from SkyDrive can also be added to your e-mail. Selecting "Files as attachments" is the familiar option for attaching a file or picture that can be downloaded by the recipient. When you select "Pictures inline", you can navigate to an image to embed the picture right in the e-mail. Repeat the action to add additional pictures. I love SkyDrive and believe that "Share from SkyDrive" is the ideal way to send large files rather than weighing family and friends inbox with large files. 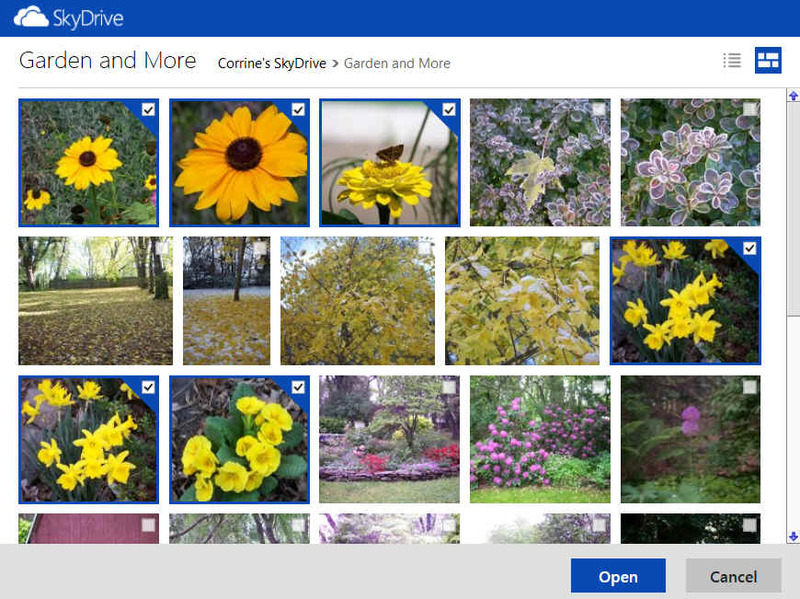 Sharing from SkyDrive is also much easier than selecting multiple pictures with the "Pictures inline" option since it is a one-step process to select multiple files at one time. Place a check in each picture or document to be shared by clicking the image or file name. There will be a note at the bottom of the e-mail with instructions to the recipient to click the link to access the file(s). It is not uncommon that there is more than one way to accomplish a task. For example, one way to print an e-mail is to click the ellipsis (...) from the Menu bar and select Print. With keyboard shortcuts set, the keyboard shortcut Shift +P will also provide the print option. There is a third way to print e-mails as well as access other useful functions. With the e-mail open, clicking the familiar Actions link, carried forward from a Windows Live Hotmail update, provides not only the link to print but other immediate actions such as Forward, Delete or identifying the e-mail as Junk. Although the Outlook.com Junk e-mail filters are excellent, information contained in the message source, often referred to as the "Full Header" is useful when questioning whether an e-mail that slips through is a phishing attempt or spoofed address. I am an Outlook.com and SkyDrive Insider. If you have a question about this article, please leave a comment and I'll do my best to assist. Learn more about the Outlook.com Insiders program here or the SkyDrive Insiders program from here. On Tuesday, June 11, 2013, Microsoft is planning to release five (5) bulletins. One bulletin is identified as Critical with the remaining four bulletins rated Important. The critical bulletis will address vulnerabilities in Microsoft Windows and Internet Explorer. The bulletins rated Important and will address issues in Microsoft Windows and Microsoft Office.